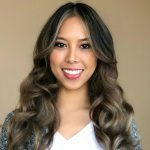 How do you know how much PoE budget you’ll need? Well, you can try to make your best guess and only buy what you need now, but that doesn’t leave room for expansion or the unexpected; which might mean completely replacing the switch down the line if/when more power is needed. Or, you could just buy the highest PoE budget switch available with as many ports as you want; however then, well, that could be more than what you have budget for, and if you never end up needing that power, it’s a wasted spend with no ROI, like buying extra TVs for that “someday” you’re going to put one into every room, but then never do. That’s where NETGEAR’s new “upgradeable PoE” switches come in. Now you can buy only what you need for today, then upgrade if and when the time comes that you need more power, rather than have to completely replace your equipment. These new Unmanaged Gigabit Ethernet PoE+ switches come in different sizes (port counts) and PoE power budgets. 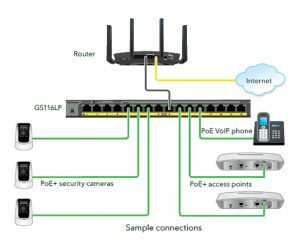 The new models include the GS108LP (8-Ports PoE+, 60W PoE power budget), the GS108PP (8-Ports PoE+, 123W PoE power budget), GS116LP (16-Ports PoE+, 76W PoE power budget), and finally the GS116PP (16-Ports PoE+, 183W PoE power budget). All models are fanless (so they’re silent), and are desktop, wall, and even rack, mountable! How’s that for flexibility? That’s a great question, so let’s explore the options and benefits of the flexible PoE power feature on the new GS108LP/GS108PP/GS116LP/GS116PP switches! First, here’s the really great/cool thing about our new GS108LP/PP and GS116LP/PP Gigabit Ethernet PoE+ Unmanaged Switches: There is only one 8-port switch, and one 16-port switch, but multiple (optional) power adapters that are compatible with each. To service the most common ends of the market, we have pre-packaged two SKUs each for the 8-port (and 16-port) switches, but by having three different power adapters that work with each, we’ve created a “good”, “better”, and “best” lineup for either the 8-port or 16-port PoE+ switches. The GS108LP and GS116LP SKUs account for the “good” versions, and the GS108PP and GS116PP account for the “best” versions, with the “better” of each available for the customer to build themselves if/when needed. The GS108LP and GS116LP are designed as the “good” with their 60W and 76W PoE budgets (67.5W power adapter and 90W power adapter respectively). The GS108LP can be upgraded to “better” with the “mid” power adapter EPS90W to give 83W of PoE power (which is also the power adapter that ships with the GS116LP). It can also be upgraded to “best” using the “high” power adapter EPS130W, which is what the GS108PP ships with, giving 123W of PoE power. Similarly, the GS116LP can be upgraded to “better” with the “mid” power adapter EPS130W (which is also the “high” power adapter for GS108LP/PP) to give 115W of PoE power. It can also be upgraded to “best” using the “high” power adapter EPS200W, which is what the GS116PP ships with, giving 183W of PoE power. Now, conversely, you could (if you wanted to, but it wouldn’t make sense) purchase the GS108PP or GS116PP and DOWNGRADE your PoE power budget by again ordering the respective “mid” or “low” power adapter that is compatible with the switch. 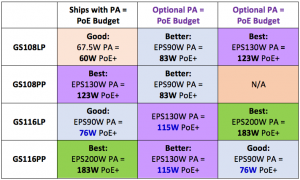 So the real benefit for the customer is that if you’re not sure how much PoE power you’ll need and have a limited budget, you can purchase the “LP” version of either switch, and then, as your PoE needs grow, you can later upgrade the power adapter to get more PoE budget, as opposed to traditional switches, where you would need to completely replace the entire switch to get more power, costing you more in the end. So how’s that for a unique idea? To see your NETGEAR PoE options, head here today!